Can you believe Thanksgiving is this Thursday? This month has already flown by! I love Thanksgiving, but it can be so stressful if we let it. Most of the time, Thanksgiving is spent in such a rush that we actually forget to be Thankful. For those of you who cook or help cook a big Thanksgiving meal, I know how stressful Thanksgiving can be. We want everything to be perfect for everyone, but it costs us our joy and leaves us exhausted. I like to plan out my week and do a little each day so that I'm not so overwhelmed and worn out on Thanksgiving. By doing a little each day, it allows me to relax more on Thanksgiving day, spend more time with my family and less time in the kitchen. 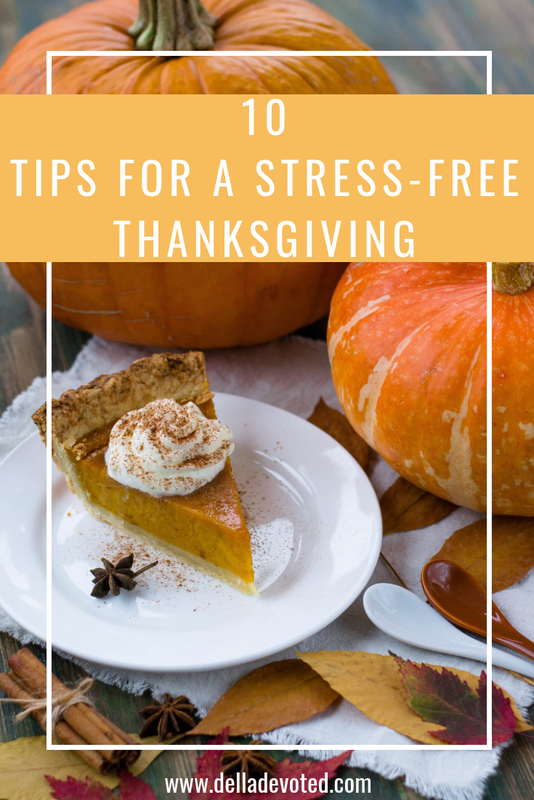 Here are 10 Tips for a Stress-Free Thanksgiving. Lay your Medium sized Turkey’s and Ham’s out Monday. If you have a large Turkey or Ham, you should have laid them out to unthaw over the weekend. Make most of your desserts on Tuesday evening or Wednesday morning. Pies, cakes and cheesecakes will still be fresh. Don't be afraid to go pre-made. Pre-made cakes and pies are such great time savers and much less stressful. Wait until Wednesday night or Thursday morning to do banana pudding or else your bananas will ruin. Tuesday- Make dips or finger foods such as cheeseballs and veggie dips. Wednesday- prep ingredients like cutting onions, celery and carrots. Wednesday- Make homemade Stuffing if you prefer homemade over StoveTop. We always make ours on Wednesday and let it heat on low all night in a crockpot. Set the table Wednesday night. Give yourself plenty enough time for your Turkey to bake or roast on Thursday morning. Give Thanks and Relax! Thanksgiving is all about being Thankful to God for your many blessings and spending time with family and friends. It's not about being in the kitchen all day and not taking time for what matters most.